Earlier this year, I took a look at flock. It didn’t impress me. In fact, I found it so useless to my browsing habits that I didn’t even bother to review it. I neglected to mention last time that Flock is built upon the same Gecko backend as Firefox. This is, as I have mentioned before, one of the best things about free and open source licenses. Firefox is a great technology, but it’s meant to be the every-man’s browser. This is expressed by Firefox’s own team and it’s why they have the plugin architecture. 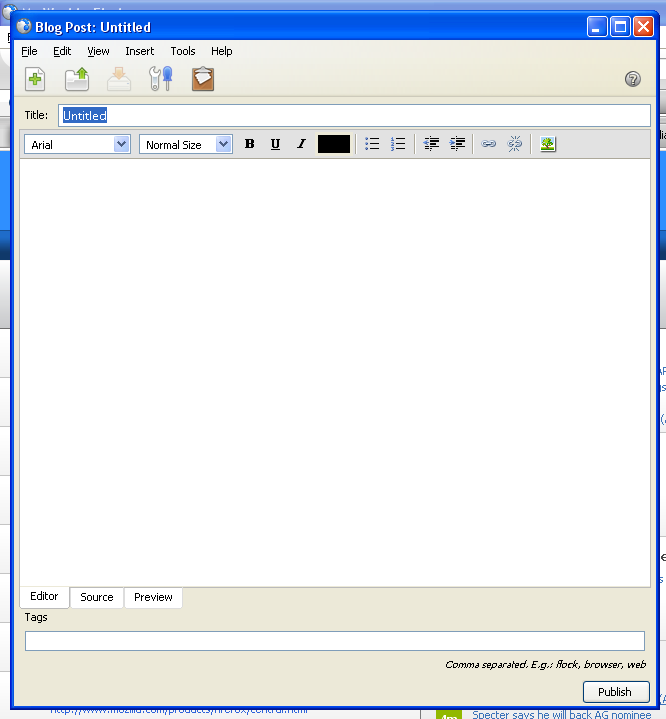 They feel that the Mozilla Suite became extremely bloated as it had a web browser, IRC client, email, and (I think) calendar built into it. It was a bit intimidating for first time users and took up quite a bit of RAM. Also, from a programmer’s perspective, it’s a lot harder to maintain something so complex. So, for Firefox they went for just developing a solid browser. Anything missing could be implemented via plugins. The plugin architecture works well for me. In fact, I seem to be atypical for a self-professed computer geek in that I do not use any Firefox plugins. Well, on my Linux machine I have the digg plugin installed, but I don’t even use Firefox on Linux. 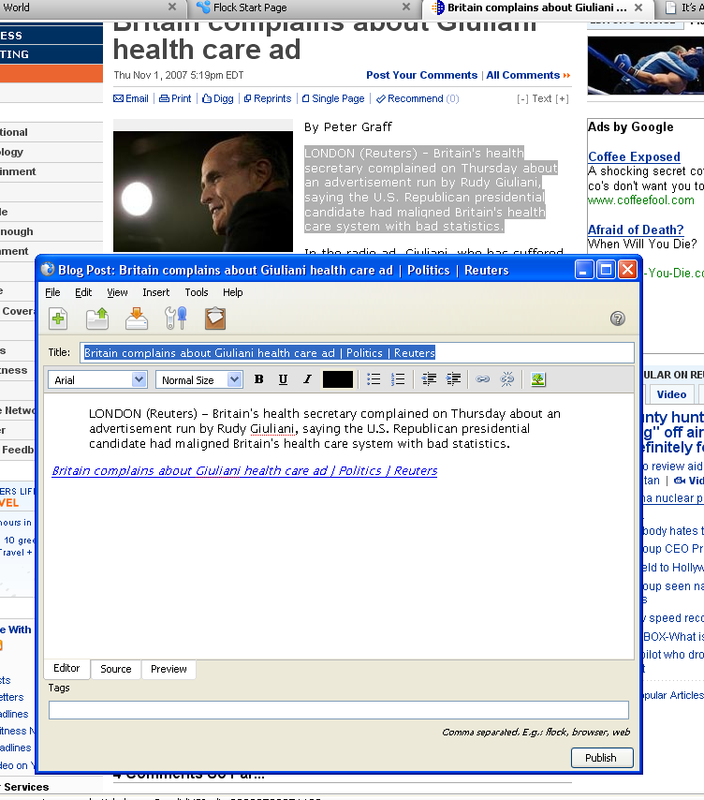 So, Firefox meets my needs by not being too bloated and providing just what I need in a browser. However, I am fine with using alternatives to Firefox as long as they use Gecko, ensuring they will be just as compatible on websites as Firefox. In Linux I use Epiphany. As you can see, it’s chock full of information you may find useful. The first column, called Favorite Sites, is something I find particularly compelling. I tend to visit the same sites every day (various web comics and news sites) so if I were to favorite them and then visit them in flock, I would expect them to always be at the top of this list. This would help me because I can’t always remember all of the links and sometimes it’s .org and I keep remembering .com or something like that. My current solution is to add these pages to my blog, but I would enjoy having them show up when I first open Flock. So, so far score some extra points for Flock over Firefox. Favorite feeds would also be useful for me as a quick and dirty RSS reader to alert me to any interesting news items. However, I’m not huge on RSS so this is a minor plus for me. Also, I tend to like dedicated RSS readers anyway. Favorite media is pretty nice as it shows me my flickr feeds (and presumably other feeds if I were a member of their other sites (more on that later)) and I can see if they have some new photos. Click on them launches the media bar – more on that later. The last difference I want to focus on from the front page is the yahoo bar. You’ll notice this on the My World page as well as in the top where Firefox has the Google bar. Well, as a recent story I’m too lazy to find mentioned, somewhere between 25 and 75% of Firefox’s revenues come from a deal they have with Google. When you search Google from Firefox, Google gives the Mozilla Foundation a chunk of change. Nothing wrong with this. Why? Because, unlike in proprietary solutions, this is not locked in. I can remove the Google bar and change my start page. So, nothing wrong with capitalism working. Google gives Mozilla some money so Mozilla puts them in the prominent page. Well, apparently Flock has a deal with Yahoo. So when you search Yahoo in Flock, they get some money. No biggie, just a little different. I like this because it means that we truly have freedom and, like in Firefox, you can change the top corner toolbar to Google. It’s pretty nice, but the main reason I stopped using 0.7 (the previous version I checked out) is a problem which still hasn’t been fixed here. While they support tagging in the blog post, it does not retrieve categories, so I would have to go in and add the categories afterwards. And if I’m going to do that, I may as well sign into my blog and post from there anyway. I went ahead and did a blog post as a test and I have some information to add here. First of all, the tags they use are not the same as WordPress tags; they are Technorati tags. (I went in and tagged it flock afterwards) Second, they do try to retrieve the categories from WordPress, but are unsuccessful. Thus I cannot apply a category. I hope they fix that – if they do, I’d probably switch to Flock. On the top, near my icon you see a little envelope which lets me know if I have any messages. Next to that is an icon that lets me know if I have any comments. Clicking on any of those would take me to the relevant page. Therefore, I don’t need to keep going back to flickr to check or be constantly reloading the page. Thus, but leaving this sidebar, I constantly know if I have any messages without having to waste time going to the page. Also I can keep from cluttering up my tabs with pages I just want to keep checking. Below that is a list of my contacts listed by how recently they’ve uploaded pictures. Clicking on their name loads up their profile page in the browser. Clicking on media brings up the media bar (more on that soon) and click on “actions” gives you some more options. Now, let’s check out the Facebook bar (as I know this is what will sell Flock to my friends and in-laws. Here you see my icon as well as my status, as set in Facebook. Next to that are notifiers of messages, pokes, friend requests, group requests, and even requests. Again, if someone were really into Facebook, this would allow them to keep tabs on what’s going on there without having to load up the page. Underneath are my friends, in order of how recently they’ve updated their profiles. Media launches the media bar and actions are specific actions to facebook. These aren’t the only toolbars, but they’re the only ones for which I have accounts. Other toolbars are twitter and youtube. In my flickr people bar I went and click on jallive and you see that it shows all of the pictures. Clicking on any of them opens it up in the browser. If you click to the right, the older pictures show. This is extremely fast and I think that it’s probably being cached in the browser when you click on each person. It’s certainly a lot faster than in flickr and I’d certainly be more likely to view a lot more of the person’s photos. So this is good for my flickr habits and for the photographers I’m viewing. Now, here’s how it works in Facebook – basically the same way. I clicked on one of my friends’ media links then on the media bar I clicked on one of the pictures. Also, I clicked on an arrow near the picture to show you some of the options. 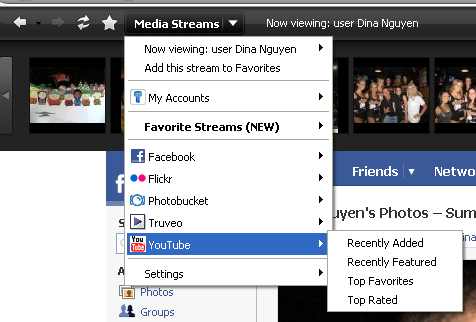 And here’s an example of which media streams appear to be supported as well as an example of the options. and favorites and a web clipboard. 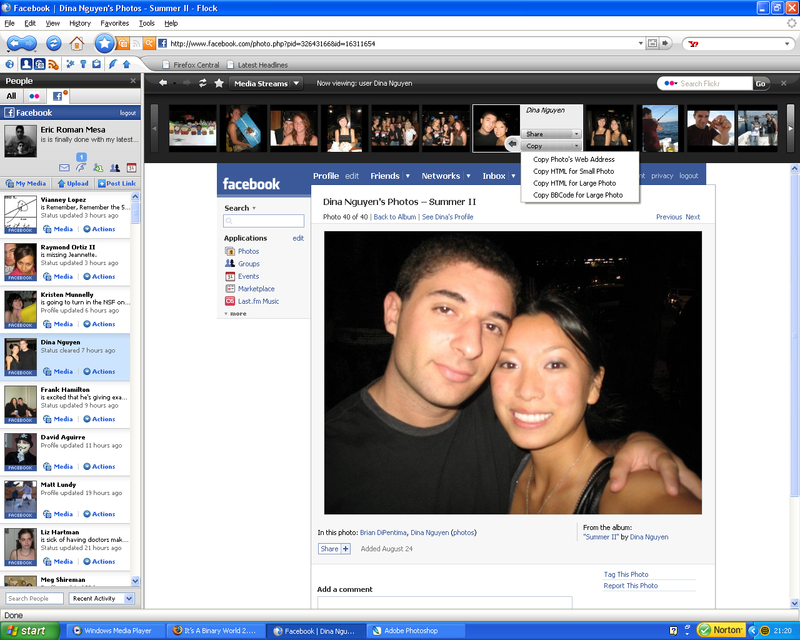 Overall, it’s a pretty nice browser. It has a lot of features although, since I’m an atypical user, most of these don’t call to me. 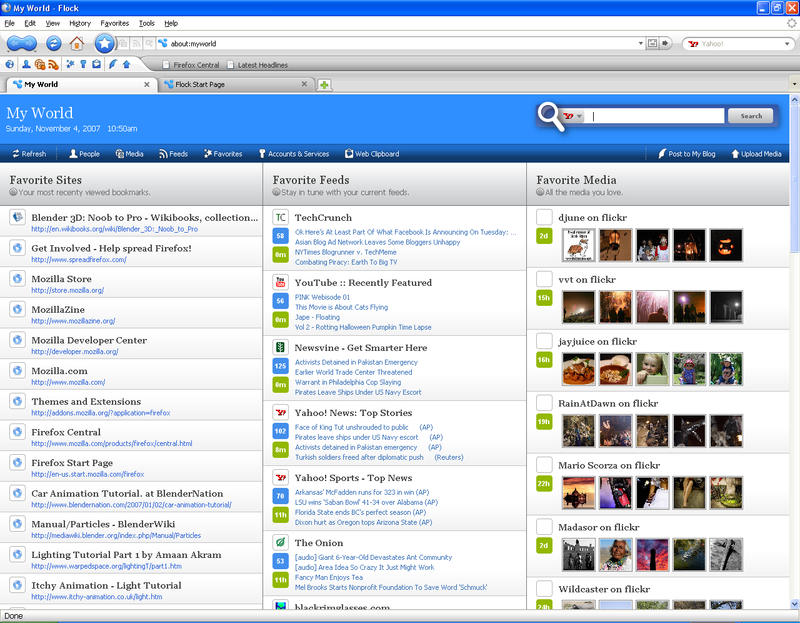 However, I plan to use it for a little while and see if I can find it to be more useful than Firefox. If I go through with it and I discover anything else worth writing about, I’ll do a followup post. I hope this post has been informative enough for you to figure out if Flock is worth switching to. Here’s the obligatory screenshot of Flock rendering my blog. You can see that the theme for my blog works quite nicely and you’re not missing out by having the sidebar open.